While the Ford Bronco SUV has historically been a three-door model, it’s a safe bet that by the time it returns to the US market in 2020, it will have picked up a five-door option, as well. 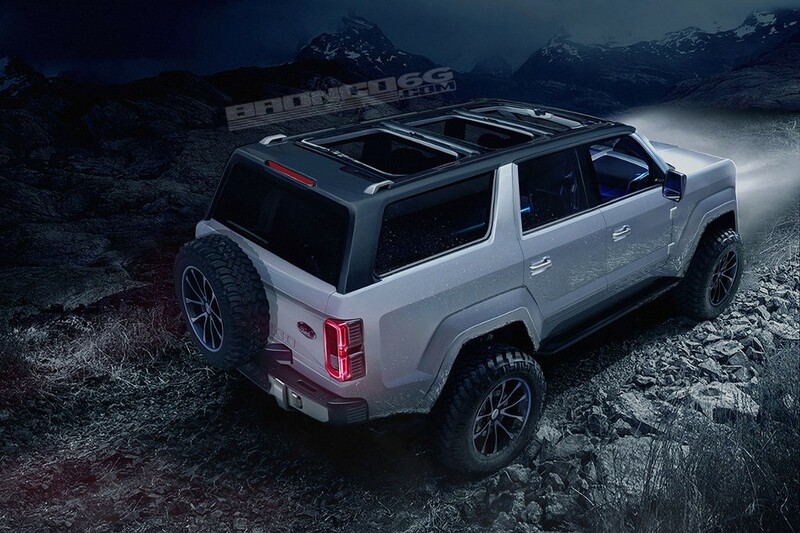 If you’re curious as to what that might look like, the folks at Bronco6G have you covered; the website’s most recent renderings, seen here, depict the future Ford Ranger-based Bronco SUV as a muddy, well-traveled five-door. Assuming that Ford is able to produce a Bronco that looks anything like this concept, the SUV could be a real stunner – even with an extra pair of doors. The 2020 (or 2021) Ford Bronco will go toe-to-toe with the likes of the lauded Jeep Wrangler. Given the success of FCA’s four-door version – the Wrangler Unlimited – and current popularity of crew cab pickup trucks, it’s perfectly reasonable to expect Ford to roll out a five-door version of its next off-road SUV. Portrayed here with removable roof panels and big, round headlamps set in a rectangular grille, trademarks of the original Ford Bronco’s iconic design, this five-door SUV concept looks every bit as brawny and rugged as Bronco6G‘s earlier three-door concept, albeit a bit longer. The next-generation Ford Bronco SUV promises to be a capable off-roader in the truest sense, with body-on-frame construction and, we hear, solid axles from Dana – the same legendary supplier that lends the Jeep Wrangler its prolific rock-crawling abilities. 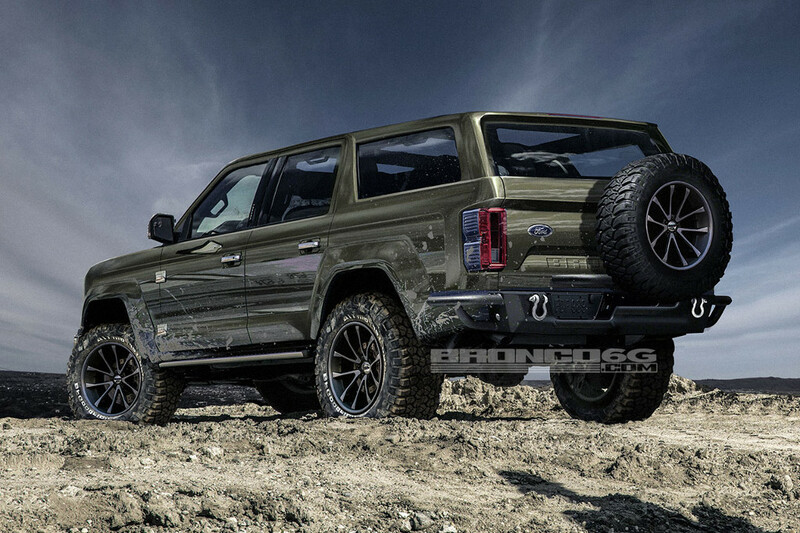 For more images of this next-gen Ford Bronco concept, head to www.Bronco6G.com. That looks awesome. To bad Ford wont build it like that and give it a 5.0 V8. They’re going to make it stupid and then give it some wack “fuel efficient” 1.6L Eco$#!t engine probably. Ford always comes so close but the screws everything up. The Bronco came with a V8 engine, which if I know ford, will be a thing of the past. It will probably have some kind of junk ecorap engine under its hood. honestly, although the renders are nice, Ford Should not bring the bronco back. it should merge with honda and make pointless vehicles like the ridgeline, the Fit and things like that since ford wants continue making junk 4-cylinder cars. it should just kill the mustang, the F-series pickup and everything else that has any kind of iconic name and just disappear! Kudos to Mopar for the Hellcats and SRT vehicles though. Vehicles with real American V8 engines! Kudos to GM for the Camaro, the Corvette, the V8 powered Silverado pickups, V8 Tahoes, Suburbans, Sierras and Yukons! Kudos to Toyota for the RCF, GSF, LC500 & the Tundra V8, Kudos to Nissan’s Titan with the V8 and the 5.0L Diesel V8! KUDOS to AMG with their nasty V8 engines! matter of fact I say well done to Everyone who doesn’t rely on BS 4cyl & twin turbo 6cyl POS engines and run V8 engines under their hoods!!!!!! My message to Ford, Get rid of your ecoboost platform and run some God Given, American style PUSHROD big cubic inch high tech V8 gasoline and diesel V8 engines!!!! Do you seriously think that they’re going to put a V8 in the Bronco? Hint: This is 2017, and Ecoboost engines aren’t going anywhere. It’s the V8s which will disappear before long. I want a two door with a shorter wheelbase or I’ll buy a Rubicon. I got no problem with the 2.7 or 3.5 turbo truck motor, they got lots of torque. Four/five door = not a Bronco, but just another cookie cutter SUV.